Shipping Integration addon allows you to handle your shipping much better and faster. WooCommerce addon enables you to print postal shipping labels directly from your Store Manager. Shipping Integration is Store Manager for WooCommerce addon for Store Manager for WooCommerce which allows you to handle your shipping more quickly and efficiently. This addon enables you to print postal shipping labels directly from your Store Manager. Shipping labels will include postage, return address, verified delivery address, and service barcodes. Currently Shipping Integration addon gives you an opportunity to handle shipping for orders using USPS (United States Postal Service) via Stamps.com. In order to use this addon you have to create account at Stamps.com. - Currently you can print USPS pre-paid shipping labels with postage from your desktop as the application is integrated into your Store Manager for WooCommerce. - Reach your customers anywhere in the US or in more than 200 countries all over the world (from the US). - Shipping Integration addon assigns tracking number to your shipping. Using this number you and your customer will be able to track your shipping online. - Save money not having to overpay for shipping services. Get everything you need to print labels at one place. - You can choose any mail class offered by USPS (First-Class Mail, Priority Mail, Express Mail, Media Mail, etc). It helps you to eliminate the problem of postage overpay. E-mail Notifications - Send your customers shipment notification e-mail with the shipping details (date of shipping, mail class and destination address). - Provide your customers with on-time shipping delivery. Shipping Integration addon ensures the reliable and secure delivery service which adds up to the overall positive image of your company. - Get the quality and reasonable price perfectly combined in this software that meets your needs. Shipping Integration addon allows you to mail your orders incost-effective and timely manner. Print the shipping labels easilyright from your desktop - no delayed deliveries or postage overpay. 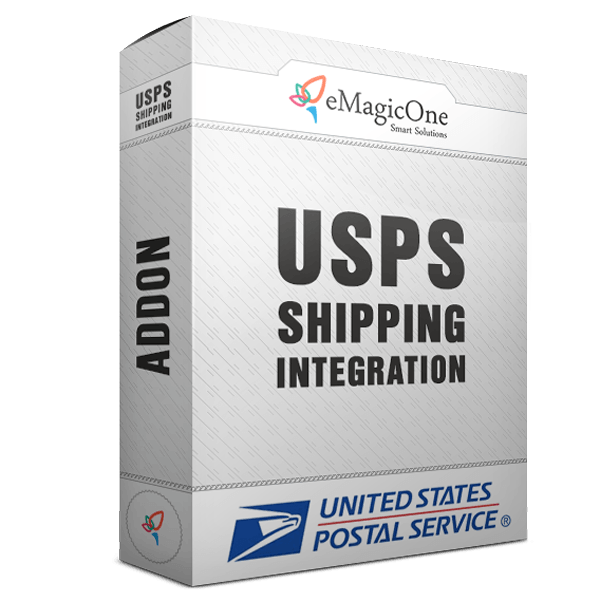 Eliminate your trips to post office with Shipping Integration addon! Current version supports USPS only. How much does shipping service cost? Please visit Stamps.com for details.